Every few years, comics go through a phase when they're willing to try some oddball projects that are probably less than commercial, just to see if anything will stick. Usually the books don't last, but that's okay; if nothing else, it's a chance to introduce new characters. That's how, back in 1999, DC gave us a book updating two forgotten characters from the Golden Age. Stars and STRIPE wasn't even a spin-off - the characters just appeared out of nowhere and were expected to helm their own title. How unusual! Young Courtney Whitmore was a normal teenage girl living in LA, until her mom married a new guy and moved the family to Blue Valley, Nebraska. Going through her new stepfather's boxes, Courtney found a costume and power belt. To annoy him, she donned the suit and went out as the new Star Spangled Kid. She turned out to be a really good hero, however, and was eventually invited to join the reformed JSA. Courtney was created by writer Geoff Johns back before it was hip to hate his work, so people actually liked her. Johns based the character on his young sister, who was killed in the crash of TWA Flight 800; he wrote stories that she would have liked, and she lived on in the DC Universe. Stargirl's costume was based on Yankee Poodle from Captain Carrot and His Amazing Zoo Crew. No, really. No, really. The details of the costume are painted on, save for the tops of her gloves, which fit over her wrists. 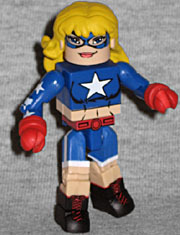 Everything is very crisp: check out the tiny red laces on her boots, or the stars on her arms. Plus, this may be the first Minimate in ages that wasn't molded in white and painted over. Her hair is a new piece, designed with enough room that she can still move her head. The figure has one accessory, her gravoty rod. Sure, it sounds dirty, but it's not. It's the tool that powered the original Starman, and was eventually passed down to Courtney by his son Jack. In fact, receiving the gravity rod was a big moment for Court - that's when she decided to be Stargirl instead of the Star-Spangled Kid. The rod is 2¼" tall, and has a translucent yellow hook at the end of a golden staff. The detailing is impressive, for such a small extra. Star's partner in this set is, appropriately enough, STRIPE. Or S.T.R.I.P.E. if you want to get nit-picky. When Courtney started acting like a superhero, her stepdad built the Special Tactics Robotic Integrated Power Enhancer so he could go with her and keep her safe. See, he's Pat Dugan, formerly Stripsey - the siekick of the original Star-Spangled Kid. The STRIPE robot has had several distinct styles over the years, with the most recent basically being stolen from The Big O. 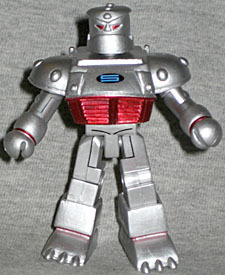 This Minimate, however, is based on the first model, which has a very "Iron Giant" feel to it. The big lower jaw, the huge shoulders, the thick chest... maybe not the little toes on the feet, but the rest of it for sure. For once, a DC Minimate using a larger body makes sense - STRIPE is a huge machine, so this figure standing 2½" tall is fine. This isn't a case like Killer Croc, where using a bigger body is obviously a mistake; for once, they used an oversized Minimate on a figure that required it. STRIPE obviously uses a lot of new parts. His boots, gloves, head and chest are all unique pieces, as you might expect. 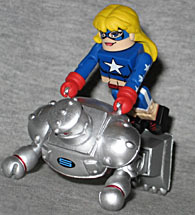 There are even little handlebars on his back, since the robot was originally Stargirl's main means of long-distance transportation. There's a big (or maybe that should be little) surprise waiting behind the armor plating, though. See, STRIPE isn't remote-controlled or anything: Pat actually pilots the suit from inside. 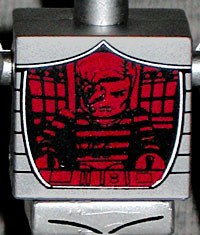 And sure enough, if you take off the piece that covers the Minimate's chest, there's a painted representation of Stripsey in the cockpit. How awesome is that! Stars and STRIPE only lasted a little over a year when it debuted, but the characters it introduced have proven to have a real staying power. They even had starring roles on several episodes of Justice League Unlimited, and that's more than you can say about some other major DC players. This is a very cool set of Minimates, withough any real shortcomings. You don't have to be a fan of Stars and STRIPE to get this pair, but you probably will be after you do.